Did you catch last night's episode of Gossip Girl? No? Neither did we. That doesn't mean you can't channel your inner Blair Waldorf. Ever a lady in public (or at least she should be), she's also shrewd and driven. (Let's just ignore the eating disorder and conniving tendencies, shall we?) You've also got a prim and proper exterior. It's as if Escada made these grosgrain bow pumps just for you (and Blair). The supple camel colored leather, the contrasting piping, 4 inch heel and bow... well, the combination just screams to be accompanied by pearls. Yet, the pointy toe adds something a bit naughty (but that's you too). No prepster worth her weight in madras will go through life without sipping AT LEAST one Manhattan. The great thing about this drink- it's such a classic you don't have to remember the ingredients when ordering. (But keep in mind that there are many variations.) The tough thing (for some) is the kick. (Even premium bourbon- like Woodford Reserve- can be a tough pill to swallow for the faint of palate). 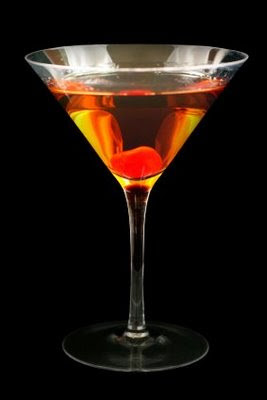 The sweet vermouth, bitters and (maybe) maraschino cherry juice neutralize it a little, but it's a strong drink no matter how you pour it. Still, you might as well prepare for your days as a lady who lunches. Please imbibe with caution. Cute shoes with broken heels are not accepted in high society.